We must become the change we seek. tomorrow -- one farm, small town or cabin in the woods at a time. 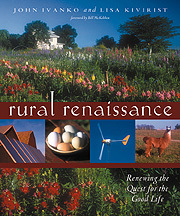 Blending inspiration with practical how-to's, Rural Renaissance captures the American dream of country living for contemporary times. Rural living today is a lot more than farming. It's about a creative, nature-based and more self-sufficient lifestyle that combines a love of squash, solar energy and serendipity. 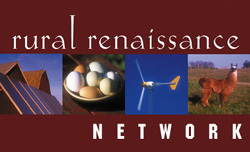 As a program within the nonprofit organization Renewing the Countryside, the Rural Renaissance Network aims to empower the rural renaissance movement by providing educational resources and how-to information to individuals, families and communities wishing to support 'right livelihood' and creative, healthy, ecologically mindful and socially responsible living in rural and small town communities across North America. Among the network initiatives are demonstration homes and businesses with how-to resources, a mentorship program, and educational workshops. Through innovative books, calendars, websites and other resources, Renewing the Countryside, brings hope and inspiration to people living in the countryside, raises the awareness of urban dwellers as to how rural people play vital roles in preserving the countryside, educates policymakers about types of initiatives they can support, and showcases individuals, businesses and organizations that are "renewing the countryside" through innovative enterprises and intiatives that combine economic, environmental and community benefits.